The Fleet Model 1 (originally the Consolidated Model 14 Husky Junior) and its derivatives were a family of two-seat trainer and sports plane produced in the United States and Canada in the 1920s and 30s. They all shared the same basic design and varied mainly in their powerplants. They were all orthodox biplanes with staggered, single-bay wings of equal span and fixed tailskid undercarriage. Accommodation was provided for two in tandem, originally sharing a single open cockpit, but in most examples in separate open cockpits. The fuselage was made of welded steel tube and the wings had a wooden spar with duralumin ribs, the entire aircraft being fabric-covered. Despite a superficial resemblance to Consolidated's highly successful Trusty and Husky designs (hence the "Husky Junior" nickname), the Model 14 was an all-new design. Originally created as a means for Consolidated to enter the civil market, the company abandoned this ambition shortly before the completion of the first prototype. The manufacturing rights were purchased by designer and Consolidated company president Reuben Fleet to put into production himself under a new enterprise, Fleet Aircraft. It was an immediate success, and in the first year of production alone, over 300 machines were sold. Consolidated quickly responded by buying Fleet Aircraft and retaining it as a subsidiary while opening a second production line at Fort Erie, Ontario, Canada. Canadian manufacturing was a great success, with some 600 examples built for the Royal Canadian Air Force as the Fleet Fawn (Model 7) and Fleet Finch (Model 16). 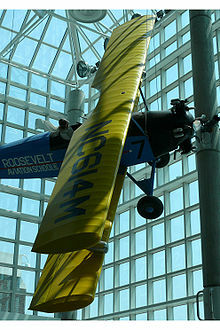 Picture - Fleet Model 2 on display in the Cradle of Aviation Museum. 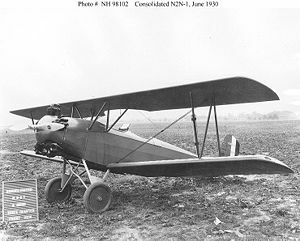 A small number of US-built machines were purchased by the US military, including a batch evaluated by the United States Army Air Corps as the PT-16 but not bought in quantity, and six specialised N2Y trainers for the United States Navy equipped with hooks to catch the trapeze on aircraft-carrying airships and train F9C Sparrowhawk pilots. US manufacturing rights were eventually sold to Brewster, which intended to produce the Brewster B-1 based on the Canadian Model 16F. Fleet Model 14 - Model 2 modified for participation in Guggenheim Safe Aircraft Competition but disqualified. ca. 300 licence-built in Romania. Taylor, Michael J. H. (1989). Jane's Encyclopedia of Aviation. London: Studio Editions. pp. 263. ISBN 0710607105. World Aircraft Information Files. London: Bright Star Publishing. File 894 Sheets 24-25. Howard, Frederic (June 1967). "The History Of The 1930 Fleet". American Aviation Historical Society Journal. Shattuck, Lemuel C. (December-January 2008). "Restoration: Fleet Model 8". Air & Space.